What type of solar incentives are available? Several types of incentives can help you go solar. Ohio’s Renewable Portfolio Standard (RPS) requires its utilities and electricity producers to generate 12.5% of their electricity from renewable sources, and 0.5% specifically from solar. 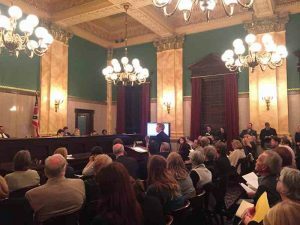 Solar supporters in Ohio testify before the state senate to defend the state’s Renewable Portfolio Standard. To help reach its solar targets, the state created an Solar Renewable Energy Credit (SREC) market. The Ohio market is open to SRECs generated in states outside of Ohio including Pennsylvania, Michigan, Indiana, Kentucky, and, West Virginia. Additionally, Ohio froze the state’s RPS standard in 2014, and the low market values represent a struggle between oversupply and an uncertain future. Before the 2014 freeze, in-state SRECs sold at a premium to out-of-state SRECs, but this distinction was removed as part of the freeze. On Jan. 1, 2017, the freeze was lifted. The Ohio SREC market was further diluted recently through a budget provision in the state budget that now allows small hydro projects including many out of state producers to qualify for SREC’s. You can find the most up to date SREC market prices at SRECTrade.com. Columbus Region Energy Fund – This program was launched in early 2016 and is run by the Columbus Franklin Finance Authority. Ohio PACE – This program, run by the Greater Cincinnati Energy Alliance, is working with commercial property owners across southwest Ohio. Northeast Ohio Public Energy Council – This PACE program is available to 13 counties in Northeast Ohio. Toledo-Lucas County Port Authority/Better Buildings Challenge – This PACE financing is administered through the Better Buildings Challenge. Ohio residents are eligible for Ohio’s ECO-Link program. The Energy Conservation for Ohioans Program, or ECO-Link, offers a reduced interest rate to homeowners installing renewable energy or making energy efficiency upgrades to their homes. This program will help homeowners obtain reduced rate financing. Homeowners can receive up to a three percent interest rate reduction on bank loans for up to seven years. The state treasurer’s office purchases an investment made by a bank at a discounted price. This purchase is made on behalf of the homeowner who is part of the ECO-link program. The lender then gives the discounted rate to the homeowner through a bank loan. Once the homeowner pays off the loan, the bank returns the investment to the treasurer. In Cuyahoga County, the Clean Energy Financing Hub brings private financing at competitive rates to building owners (small businesses, large commercial/industrial, local government, non-profit, and faith-based institutions) in Cuyahoga County for energy efficiency upgrades and solar projects.